Dr. Wesley Fryer is a teacher, technology director, digital learning consultant, author, digital storyteller, and change agent. With respect to school change, he describes himself as a “catalyst for creative engagement and collaborative learning.” He is the Director of Technology for the Casady School in Oklahoma City. In 2013-2015 he taught 4th and 5th grade STEM (Science, Technology, Engineering and Math) at Independence Elementary in Yukon Public Schools in Oklahoma. Wesley completed his Ph.D. in Curriculum and Instruction from Texas Tech University in 2011. He is the author of several books on effectively using digital technologies to communicate and assess learning.His “Mapping Media to the Curriculum” book series and digital literacy framework focuses on helping students “show what they know” with media and create digital portfolios. He is an organizer for Oklahoma EdCamp and the PLAYDATE OKC professional development conferences. He has taught technology integration courses for in-service and pre-service teachers as an adjunct instructor for the University of Montana, the University of Central Oklahoma, the University of North Texas, and Wayland Baptist University. Wesley has served as an organizer for the annual K-12 Online Conference since it began in 2006. 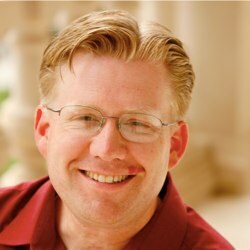 His blog, “Moving at the Speed of Creativity” (www.speedofcreativity.org) was selected as the 2006 “Best Learning Theory Blog” by eSchoolnews and Discovery Education, and is utilized regularly by thousands of educators worldwide. He leads 3 day iPad Media Camps, STEM camps for teachers and students, and digital oral history workshops with Storychasers. Wesley is a passionate advocate for digital oral history and works to empower people to archive the stories of their families and community. Wesley was selected as a 2014 PBS LearningMedia Digital Innovator in April 2014. He become a Google Certified Teacher in 2009, was named an Apple Distinguished Educator in 2005, is a 1992 graduate of the US Air Force Academy, and a Fulbright Scholar. He has served on the education committee of the Oklahoma Creativity Project. His educational background includes service as an elementary STEM teacher, 4th grade classroom teacher, campus technology integration specialist, college director of distance learning, state director for education advocacy for AT&T, and director of technology for a state historical association. Wes lives in Oklahoma City where he works with school teachers, librarians, and administrators interested in effectively integrating technology into classroom instruction with a focus on student-created multimedia and digital portfolios. More information (including a booking inquiry form) for Wesley’s keynote, breakout session, workshop offerings, and videoconferences are available on his “Speaking” page. Recent and upcoming presentation handouts / resources are available on wiki.wesfryer.com. Additional details are available on Wesley’s Curriculum Vitae. More links to Wesley’s digital footprint are available on his Google Profile, in his online press kit and on about.me/wfryer. Stay up to date with Wes by subscribing to his weekly email newsletter, following him on Twitter (@wfryer), Facebook, Google+, and liking the Facebook pages he periodically updates for Playing with Media and Speed of Creativity Learning LLC.